Roof coating is a roofing covering made of either Asphalt or coal tar i.e. bituminous or completely adhered monolithic fluid. The roof coating is the outmost or remotest layer of the entire roofing system. It is the typically exposed layer of shield for a roof, and receives the thrashing from the sun, rain, hail, snow, wind and UV rays. Roof coating reflect the sun and weather, thereby tumbling cooling operating expense and the need for extensive cooling systems. Roof coating’s elasticity permits it to stretch and contract this property is referred to as elastomeric roof coating. A roof coating is an extra method of waterproofing and at the same time allows trapped moisture to become apparent. Roof coatings can be applied in diversity of colors to go with all roofing styles and designs. Some roof coatings are also intended or projected to prevent the growth of moss or algae and are eco-friendly. Further roof coatings have ability to avert corrosion, and are flame-resistant. Anchor Roofing, in Houston, offers comprehensive roof coating and mending services. Our roofing contractors work with the finer roof coatings available, and try to amalgamate all these beneficial features so that your roof will resist the most complex and harsh weather conditions, and in turn, have an improved life expectancy. As some of them are elastomeric based or others acrylic resin roof coatings. The stickiness to your roof depends on the substance or material your roof is made of. E.g. bituminous roof coatings are more adhesive to wood, while metal roof coatings can be bituminous roof coatings or elastomeric. Depending on the type of weather you live in and the needs of your roof and building (commercial or residential), Anchor Roofing employee would be more than happy to go over with you in details about which roof coating is most suitable for your roof. Our roofers in Houston have experience within the repair of pitched, flat and other roofing constructions. The replacement of manufacture woods, natural slate tiles, shingles and tiles should be completed as a matter of importance to evade any further damage to the contents of the construction or the roof itself. This process, when attended to by Anchor Roofing representatives or roofers will be done on a timely and cost-effective basis, and with related materials to make sure a faultless or flawless repair of your damaged roof. The coating of a flat roof is one more illustration of roofing projects within which our qualified, skilled and expert roofers have extensive experience and knowledge. This procedure requires superior workmanship and materials to make sure that the roof is properly sealed, weathered and finished appropriately. Additional services offered by our roofing company consist of the mending, installation or replacement of metalwork and roofs as well as the restoration or replacement of exterior roofing timbers and fascia boards. 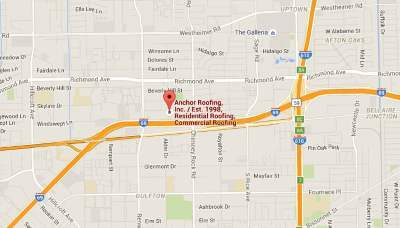 Anchor roofing in Houston guarantee all materials and work given by our roofers.